In order to select Lamar Jackson, the Baltimore Ravens traded this and next year’s second round pick. 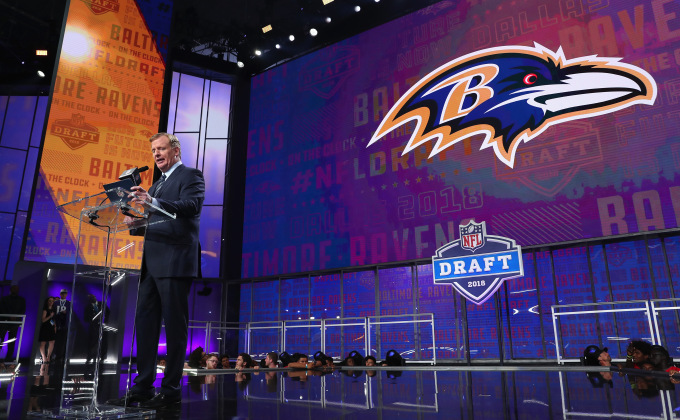 Although the team did not pick in the second round, Baltimore picked twice in the third round. Going into the day, the team was set to pick at 65 and 83 overall. However, the front office made a flurry of trades, and the Ravens were able to amass a plethora of day three picks, while also picking at 83 and 86 on day two. The Baltimore Ravens used these two picks to draft Oklahoma OT Orlando Brown and Oklahoma TE Mark Andrews. With the 83rd pick in the third round, the Baltimore Ravens selected offensive tackle Orlando Brown. Brown’s father, Orlando Brown senior, played for the Baltimore Ravens during his NFL career. Sadly, he passed away in 2011, when Orlando Brown Jr. was just 15. Now, following in his father’s footsteps, Orlando Brown looks to compete right away for the starting right tackle spot. Brown originally was seen as a first-round prospect among many in the NFL scouting circles. However, a poor performance at the combine severely damaged his stock. The tape doesn’t lie, however. Orlando Brown was a monster on the field for Oklahoma, dominating in every aspect. The Ravens are getting a major steal here, as Brown could be the best tackle in this draft class. For a third-round pick, Ozzie Newsome found major value, as Brown has a chance to become an impact starter right away. A few picks later, with the 86th pick in the third round, the Baltimore Ravens selected another Oklahoma Sooner. Mark Andrews is a vertical thinking tight end, a big receiving threat, similar to Dennis Pitta. Andrews is 6’5″ tall, and 256 pounds heavy. Pitta was 6’4″, 245 lbs coming out of BYU. Andrew’s isn’t much of a blocker and is a tight end in name only. He’s coming off his best year at Oklahoma, with 62 catches, 958 receiving yards, and 8 touchdowns. The selection of Andrews is meant to signal change at the tight end position. Baltimore picked Hayden Hurst with the 25th overall selection in the first round, and the duo will likely become the leading tight ends of the group. Maxx Williams, Baltimore’s second-round pick from 2015, has yet to really make an impact. It will be interesting to see how Nick Boyle fits into the offense in 2018. He made an impact primarily as a blocker but did well in the receiving game as well.